The beauty of this blondie recipe is that it’s fast, one-bowl, and no mixer is required. It’s 4-minute batter. In a medium microwave-safe bowl, melt the butter, about 60 seconds. To the melted butter, add the brown sugar and stir to combine. Add the egg, vanilla, and stir to combine. Add the flour, salt, and stir until just combined, taking care not to over mix or the blondies will be tough. Fold in chocolate chips, fruit (I don't halve the cherries: I like them chunky and big), and pour batter into prepared pan, smoothing it lightly with a spatula or offset knife if necessary. Bake for 27 to 32 minutes, or until edges begin to slightly pull away from sides of pan and center is set. 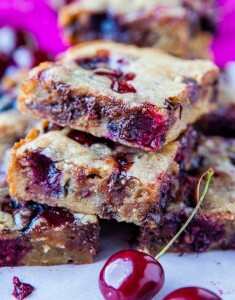 Baking time will vary based on types of fruit used, fresh, frozen, and the moisture content of the fruit; and how gooey you like your blondies. A toothpick inserted into the middle may not come out clean due to the chocolate chips or juicy fruit. Allow bars to cool for at least 1 hour before slicing and serving. Blondies can be stored in an airtight container at room temperature or in the refrigerator for up to 1 week or frozen for up to 3 months.